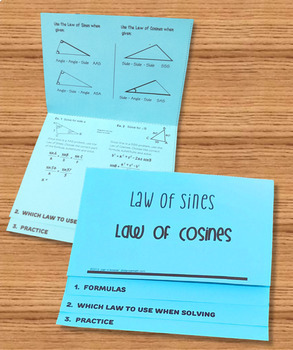 This Law of Sines - Law of Cosines Foldable Flip Book is designed for Geometry, Algebra 2, or PreCalculus (depending upon curriculum). 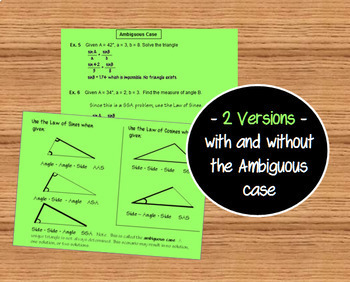 Included are two Flip books with both guided examples and practice problems. 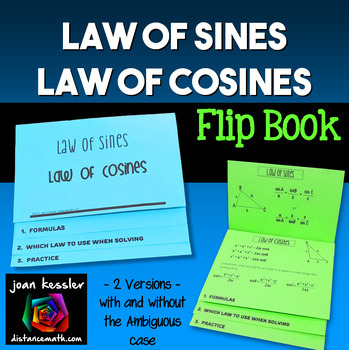 One book includes the ambiguous case of the Law of Sines, and the other does not. Each Flip book requires one sheet of 8 ½ by 11” paper. Double sided Printing and/or copying is required. They are easy to assemble - no glue, no tape, no mess. 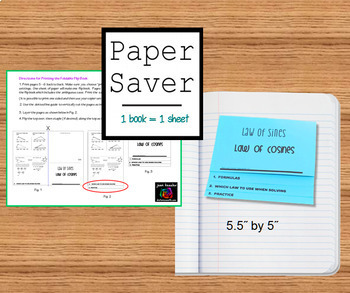 Printing and assembly directions are included as well as a Teacher’s version of the Flip Book with Solutions to the practice problems. Thanks for shopping in my store. Custom product requests and Custom Discounted Bundle requests gladly accepted. If you have any questions or comments please contact me by email me at: teachdydx@distancemath.com. ©2019 Joan Kessler (distancemath.com™). Please note - this resource is for use by one teacher only. Colleagues must purchase additional licenses or you may purchase licenses for them at a discount. Note: You may not upload this resource to the Internet in any form.